Isabella needed some alone-time with me. That much I knew. So on Tuesday morning, I trucked in an army of baby-wranglers to deal with the twins (at one point, the platoon included two aunts and my grandma) and she and I took off to her happiest place on Earth. 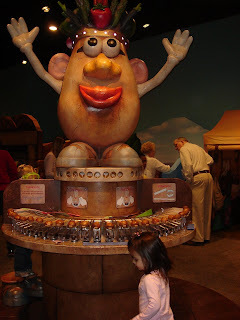 She didn't whine, beg for toys in the gift shop, or demand that I carry her as we moved through the museum, all behaviors she tends to exhibit when we're there. Instead, she was perfect - running through the halls as if she owned the place, taking my hand and leading me to tables to do various art projects, smiling and laughing and having a blast. We spent two blissful hours there. It's been a long time since two hours have elapsed in Isabella's world without at least one tantrum. And in this time, I reacquainted myself with my little girl, with her quirks and mannerisms and nonstop chatter, with everything that makes her unique and wonderful and fiercely loved. At one point she looked at me and said, "This is my best day." It was my best day too, baby girl. My sister and I are 19 months apart. Growing up, this seemed like too small a gap between us, as everything I was allowed to do, she was also. My mom told us we had to be 10 before we could get our ears pierced. Guess who was able to get hers pierced at 9? 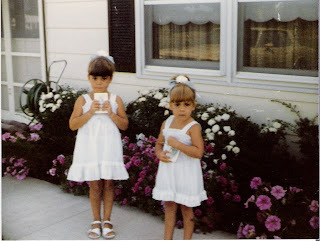 My sister also shared my bedtime, my tv-watching privileges, and my look, because my mom dressed us as if we were twins for years. There were benefits to the relatively small gap. 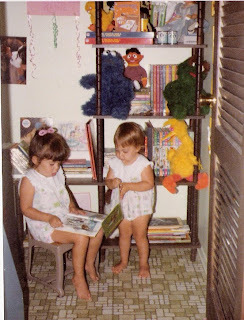 We "shared" toys and interests, and we had a playmate whenever we wanted one. We banded together easily against my mom when I wasn't busy hacking off her long, flowing, waist-length blond locks in a fit of jealousy when I was four (my own hair was as it is now: thin, scraggly, and pin-straight), and she wasn't bent on avenging her hair loss by stabbing me in the forehead with a fork several years later. But I spent a lot of time at my grandma's when I was a child, and I did so because she lavished me with undivided attention. She took me out to lunch. She took me shopping and bought me whatever I wanted. She took me to the arcade and handed me fistfuls of quarters so I could dominate the Ms. Pac Man machine. I was treated like a queen at her house. My every wish was fulfilled, while my little sister stayed home with my mom, receiving her own undivided attention. I've been thinking a lot about the age gap between my children: 2 years and 2 months. I know many of you commented that Isabella would be behaving the way she is with or without the twins, and I know you're probably right. But I often think that if I had waited to try and have a second child until she was three (or older), things right now might be a whole lot better. A few weeks ago, my dad gave me two books about dealing with the "Terrible Twos." I was thumbing through one the other day and I came across an interesting study. According to a group of child behavioral specialists, the ideal spacing between children is 3.5 years. The first child has ample time to be the "sitting king or queen," and is secure enough to share her world and her parents' attention with a sibling. The first child might be starting preschool at this age too, which helps add another valuable and exciting dimension to the child's life, which until that point was centered mainly around her parents. Perhaps there's something to this. Isabella craves my attention and when she can't get it because I'm occupied with the twins, I know she's upset and acts out. She plays by herself a lot now, which is great, but she still asks for me to involve myself in her play too, and more often than not, I can't. Friday was a particularly bad day here, and when the hubs got home from work, I started to get my jacket on to go for a quick walk, and Isabella lost it and begged me not to leave. That's something she's never done before. She also dragged me away in tears from a photo the hubs was taking of me and the twins. 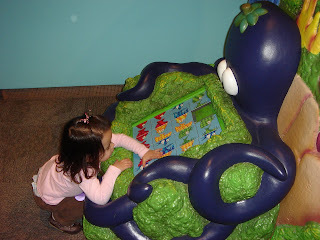 She couldn't articulate why she was doing this, but I knew why all the same. The twins didn't arrive my accident. Fertility treatments, especially IVF and FET, grant you the unique ability to choose the month of your child (or children's) birth, assuming the cycle is successful. I wanted my children close in age, but I think I didn't give enough consideration to just how this would affect Isabella before I jumped into the FET. Would waiting another year or two have mattered? These days, I tend to think it would have. Isabella turns 29 months today. Incredibly, she will turn 2.5 years old next month. This past month has been a challenge. Like her mother, Isabella is headstrong, opinionated, and very, very strong-willed. When combined with the antics and emotional upheavals that are part of being two, these qualities are exaggerated and have led to many tantrums and many more episodes of undesirable behavior. Isabella is a pretty smart little girl. When she sees me stuck in our living room chair feeding both babies and therefore unable to move, she often takes these opportunities to engage in behavior she knows is not allowed. She climbs the stairs. She throws her toys and books around. She starts pressing buttons on the DVD player. She starts yelling or singing at the top of her lungs. I'm left to beg and plead her to stop with absolutely no way to redirect her behavior other than my voice, and she's highly adept at tuning me out. I know why she's doing this. She wants my attention and knows I'm unable to give it to her. This makes me feel simultaneously guilty and frustrated with her antics. I've taken to turning on the tv* while I'm nursing the babies just to keep Isabella safe, on the couch, and occupied. Of course, doing so creates another wave of guilty feelings over not being able to play with her. 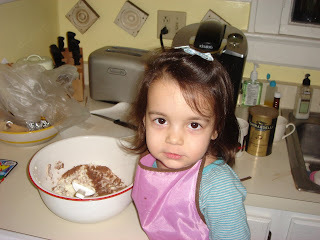 Her recent bad behavior isn't always relegated to the twins' feeding schedule. She's throwing her fork at dinnertime. She's refusing to pick up her toys. She's deliberately yelling and making noise when we ask her to use a quieter voice. The tiniest perceived injustice sends her over the edge and into tantrumland. If she doesn't get what she wants, she whines and cries. She's like a walking and talking grenade. If you don't handle her carefully, she's likely to explode at any time. Admittedly, my patience with her has been shorter than it normally is. I'm trying to find small pockets of the day to spend uninterrupted, one-on-one time with her, but the twins' never-ending needs make this really difficult. This is one of my worst fears coming true: there's just not enough of me to spread amongst three kids. On the lighter side of things, Isabella has taken an interest in dressing herself over the past month. Of course, this process takes at least four times as long as when I dress her myself, but she insists on putting on her socks and shoes each day, and taking them off at night. I am seriously considering taking Isabella for her first haircut. The front isn't too bad, but the back is a mangy mess. I think she'd look cute in a haircut similar to Matilda Ledger's. She's become very nurturing with the baby doll I bought her for Christmas. She's swaddling her, taking her for rides in her stroller (sometimes to "restaurants" in addition to "Dunkin Donuts") burping her, and feeding her a bottle. I'm waiting for her to nurse the doll. It's only a matter of time. We've made slight progress on the potty-training front. She will now sit on the toilet. We take her to sit on it several times a day. Of course, sitting is all she's doing on it, but at least she's willing to sit there. 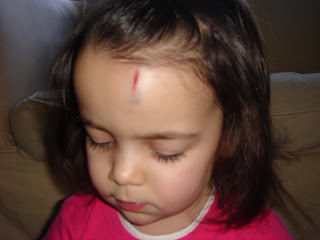 Last month, the potty and the toilet were her mortal enemies. *Thanks SO much for all the tv show recommendations. We've tried a few of them, and so far, Isabella loves Wonder Pets and she also likes Curious George. She's also a fan of Martha Speaks. I like Word World, but so far, she doesn't. How is it possible that we share a bloodline? For the past year or so, I've had "The Official George W. Bush Days Left in Office Countdown Clock" in my sidebar. Like many Americans, I have waited years for the end of the Bush presidency. Like many Americans, I have been appalled at the direction in which he's taken my country. Like many Americans, I have loathed the way he has decimated the United States' relationships with allies all over the globe, his myopic world view, and his absolute his arrogance and unrepentant stance on the disastrous decisions he's made over the last eight years. Today, I have hope. I don't believe Barack Obama is the mythic healer of all the nation's ills. He's only human, and the country he's inheriting is in a tailspin. But for the first time in a long time, I feel as if we're headed back in the right direction. On this hugely important day, the world is a whole lot better and brighter than it's been in eight long years. I can't wait to turn on the tv and watch history unfold. Friday started off very, very bad indeed. 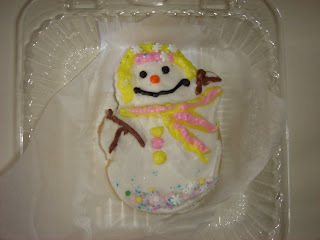 Even the procurement of the most sugar-laden treat the supermarket had to offer didn't turn the day around. And then this arrived in the mail, from a special blog friend who sent it because she "doesn't live close enough to offer babysitting." And everything was right with the world. Luci and Nicholas turned three months old yesterday. 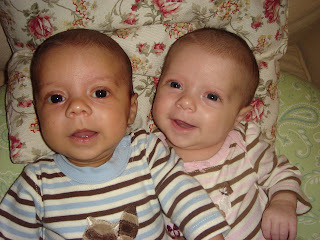 In many ways, it doesn't seem possible that this much time has passed since they were born. In others, these have been the longest months of my life. I'm writing this on a good day. They're currently both asleep, something that rarely happens during the day. We're coming off two excellent nights, which I hope is a direct result of our new nighttime approach: nursing around 7 or 8pm, followed immediately by swaddling and placement in the pack-n-play in the living room. Both nights have resulted in large stretches of sleep, the likes of which are unheard of here. But they are still very fussy babies. I suspect that Nicholas (and perhaps Luci too) has reflux. His nursing sessions often end with him screaming uncontrollably for 10 minutes or more. Their pediatrician is recommending small doses of milk of magnesia to help, since gas drops and gripe water haven't been helping. I've noticed they nurse a lot better individually than they do when I'm feeding them together. It's certainly more comfortable for me to nurse them this way, and I really enjoy the luxury of snuggling with just one baby, but more often than not, I'm pressed for time and I have to nurse them together. When I'm by myself and the suspected reflux kicks in, it is unfun. Very, very unfun. On the brighter side of things, they have started smiling a whole lot more this past month, and have started to coo. This makes tolerating their hours-long screaming fests a bit easier. But only a bit. They both seem to enjoy spending time under the floor gym, Nicholas especially. They love the bee mobile above the changing table, and their big sister too. I think she's the recipient of most of their smiles. I spend the day rotating them through the various baby apparati: our swings, the bouncy seats, the floor gym, the pack-n-play. 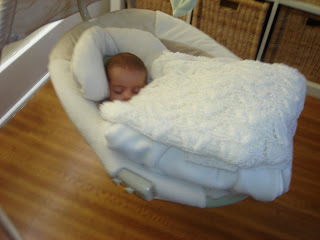 But by far, they spend the largest chunks of their days tucked into the Bjorn. They calm down immediately when they're in there. I have learned to do just about everything with a baby strapped to my chest. Am strong like bull. I've noticed that Nicholas is growing a lot faster than Luci. At their two-month appointment, there was a 10 ounce difference between them, but while he's noticeably grown since that visit, I don't think she has. This has me slightly concerned. They were both under the 5th percentile for both height and weight at their 2-month checkup, so that's encouraging (if only because they're both under-achievers) but I'll be very interested to learn of their growth at their 4-month checkup next month. Luci and Nicholas have yet to develop any kind of predictable waking and sleeping schedule, which is just killing me. I never know what's going to happen from minute to minute. I have no idea when they'll awaken for the day, when they'll nap, whether I'll have to nurse them together because they're both screaming, or when I can nurse one at a time. They might be fast asleep when I need to get Isabella up and fed in the morning, or they might be screaming because they're hungry, or need attention. I might be able to drag my arse out of bed at 6am and run on the treadmill while the hubs gets ready for work, or I might be pacing the floor trying to rock one (or both) of them back to sleep. I might eat my breakfast at 7am, or it might be 10am before I get a spare second to myself. For a tightly wound and highly scheduled person such as myself, this is incredibly frustrating. Because of their erratic sleeping and waking patterns, we're breaking all the sleeping rules with them. We let them sleep in their swings. They'll sleep for hours in their car seats. I'm nursing them back to sleep. But at this point, I just don't care. At this point, we're still in survival mode. Nothing about our lives is normal. We've had exactly one person (one of my friends) over to our house in the evening (when all hell is usually breaking loose) in the past three months, and he bolted for the door soon after the twins started their nightly crying jag. I can't expect things to be as they were, to have the time to collapse in exhaustion on the couch once Isabella is in bed and watch very bad reality tv (is anyone watching The Bachelor? I have lots to say about this show. Stay tuned!) until it's time for bed. Their adjusted age is only 6.5 weeks, after all. But I am looking forward to the day when we an look back at our lives right now and wonder how in the hell it was that we managed to maintain some semblance of sanity. They're lucky that their parents find them pretty cute. 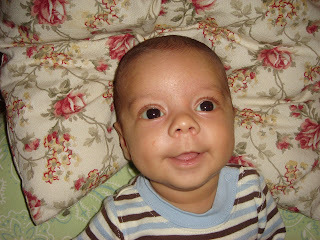 A droolly smile can serve you well when you're three months old. The arrival of the twins has made me much more relaxed in my anti-TV stance. 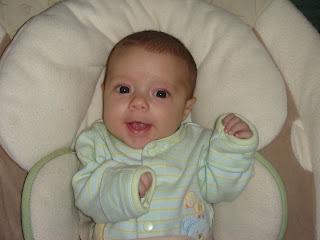 When Isabella was born, I decided to follow the AAP's guideline of no tv before the age of two. Of course, we didn't last the full two years. Isabella started watching Sesame Street once a day around the age of 15 months, and this past summer, she started watching Clifford once a day as well. However, in the later months of my pregnancy, I started relying on the television to entertain Isabella a great deal more than I did before. I was so exhausted I could barely move most of the time, so whenever I needed 10 minutes on the couch last September and October, I would switch on the tv for her. I never wanted to use the television as a babysitter, but use it I did and now, with the twins in the picture, I have no choice. If I'm nursing them and Isabella is particularly "spirited" at the time, I turn on the tv to calm her down and keep her occupied for a half hour. Nursing two babies at the same time with no hands free to redirect a trouble-prone toddler is a risk I'm not often willing to take. I used to feel a lot of guilt each time I switched on the tv for Isabella. The tv is now mama's best friend. 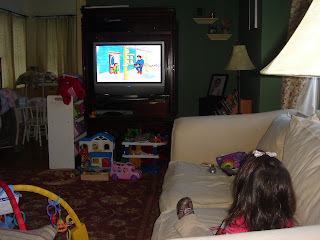 Recently, Isabella has started watching Caillou on PBS. I had never heard of Caillou until my grandma bought Isabella three Caillou books, and I noticed on the back of the books that they were based on the television show. I found it on PBS, and growing sick to death of repeat episodes of the Big Red Dog decided to see if Isabella enjoyed watching it. She did, and Caillou is now the only show she wants. The show is pretty decent as far as kids' fare goes, it's pretty PC, and Caillou has friends of different races and backgrounds. Yet when I've mentioned to friends that Caillou is one of Isabella's favorite shows, they're shocked that I let her watch it. According to at least four of them, Caillou is "too whiny" and they don't let their kids watch the show because they don't want them emulating Caillou's "Nooooo! I don't want to" or "That's not fair!". These friends don't know eachother, so it's not as if their opinions are part of a vast conspiracy against the bald four-year-old. 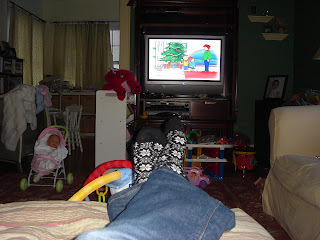 I haven't noticed an uptick in Isabella's obstinate behavior since she started watching Caillou. She's been kicking around those phrases for a long time. But, I'm curious: Do your kids watch Caillou? What do you think of the show? A friend recently turned me on to our cable provider's On-Demand preschool channel, but there are so many choices and I don't have the time to wade through all of them. If you have any recommendations for toddler programs that are at least somewhat educational and won't make me want to pluck out my eyes with a fork upon the 455th viewing, please leave me a comment. 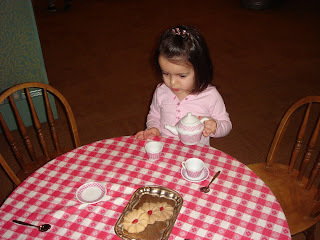 Thanks so much for all your support and encouragement on my preschool post. 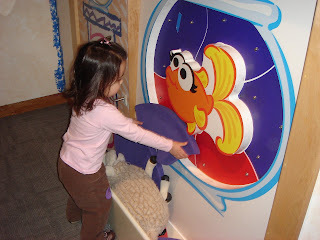 Isabella LOVED the preschool open house we attended on Saturday morning. The second we entered the room, she took off to play and never once looked back to see where we were. She was completely comfortable in a totally unfamiliar environment. Of course, her reaction might be different when I tell her I'm leaving, but I'm very proud of the way she reacted. Her first words as we were walking to the parking lot? "I want to go to preschool again!" I now interrupt your regularly scheduled reading of posts in which I bemoan the sorry state of my existence to complain yet again about my wonderful, generous, and yet completely wack-a-do grandmother. 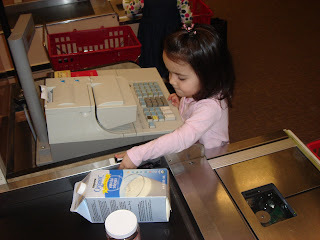 In a few weeks, I will enroll Isabella in preschool for this coming September. I'm in the process of scoping out our area's preschools, and this Saturday we're attending an open house for one we're interested in. I casually mentioned our plans to my grandma a few weeks ago. In families where the ties that bind don't have the nasty habit of strangling you at times, grandma might respond with a, "That's nice, dear" and move on to topics of greater interest to the geriatric set, such as the current far-flung plotline of her "story" or how the true winners of Dancing with the Stars were robbed last season. At the time, grandma expressed mild shock and concern. Preschool at age 3? Nonsense. What if she cries? Refuses to go? Contracts a disease and infects the twins? I brushed off her concerns and tried to explain that preschool for three-year-olds is the norm now and that I'm not about to stuff Isabella into a bubble to keep her insulated from the germs that will end up boosting her immunity in the long run. Remember, grandma also thinks I am compromising my children's fragile cores by taking Isabella once a week to a toddler gym class. However, on Monday when she brought up the topic, she wasn't so benign. Out of nowhere, grandma says, "And if you think Isabella is going to go to preschool willingly, you're crazy." She then proceeded to list a litany of reasons why preschool for three-year-olds, and Isabella specifically, is a horrible idea. 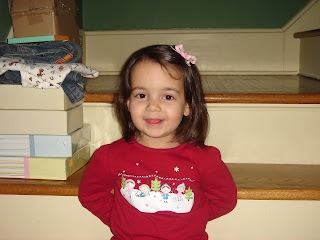 In addition to the high likelihood that Isabella will contract Scarlet Fever, TB, and consumption, she said Isabella won't learn anything there that she doesn't already know or that I can't teach her (because you just know I'm in the process of setting up a schoolroom in my basement, what with my copious amounts of spare time). Grandma believes Isabella will cry and try to escape (apparently, four-year-old preschoolers, kindergartners, and 1st graders crying for their mothers is okay), and that preschool is where "mothers who don't want to watch their children dump them off." She said, "mothers are selfish and like to socialize," and that preschool is a place for them to drop off their kids so they can have time to themselves. To which I said, "And that's a problem?" I think what irked me the most about this "discussion" with grandma is her belief that mothers should not have lives outside of caring for their children. Yes, she cares about Isabella's health and mental wellbeing. She doesn't want her upset about going to preschool, and of course, neither do I. But when she says that preschool is a dumping ground for mothers who want time to themselves, she's essentially giving credence to the mistaken characterization that so many mothers are fighting to overcome: that in order to be a "good mother," women must become mommy martyrs, and sacrifice their own desires, goals, and dreams for those of their children. We're not to have social lives. We're not to hit the gym to try and lose our baby weight or meet friends for coffee. And we're certainly not to work outside the home and have our children attend daycare, even if we love our jobs. And if you do any of these things (as apparently I am by sending Isabella to preschool) you're not a good mother. My grandma never said I wasn't a good mother. She always referred to "mothers who do this" and "mothers who do that." But the implication was quite clear. Even though I'm hardly going to be whooping it up with two one-year-olds at home next fall, and even though Isabella will more likely than not LOVE preschool, I'm derelict in my motherhood duties by enrolling her. It's beliefs like grandma's that place mothers under never-ending pressure and stress. So many moms I know feel enormous guilt for working while their children are in daycare, even though they love their jobs. Other mothers I know won't let themselves socialize with friends without their children tagging along because they can longer see where their children's lives end and theirs begins. The "good mother" mystique is maddening and I refuse to play along. I'm thinking that asking my grandma to babysit the twins while we attend this Saturday's preschool open house is probably out of the question. The hubs goes back on vacation today. We've been job-sharing at home for two weeks over the Christmas holiday, but his vacation (read: return to work) begins again now. He's long contended that January is the worst month of the year. The holidays are over. The family gatherings are done. And January is usually very harsh and snowy here. But this year, although he will deny it, I think he's secretly excited to return to work because compared to being home all day with the babies, work is a vacation. And me? Well, I'm where I always am. Home. And trapped here, really, because leaving my house by myself with three small kids, two of whom are incredibly fussy and probably colicky, who have no predictable schedule, and who basically require constant nursing, is far too daunting a task for me to even consider right now. Over the holidays, we were able to break free a few times and go out, just the two of us. My mom was in town and stayed with us for a few days, which was pure bliss. Having an extra set of incredibly capable and helpful hands was the best Christmas gift I received. So as not to overwhelm her with caring for three kids at once, we waited until Isabella went down for her nap, and then we went out to lunch once, and another time we went to the movies. We saw Seven Pounds, which was...interesting. Let me just say this about that film: I'll never look at another jelly fish the same way again. I've never been a big New Year's resolutions person. Last year, I attempted to set monthly goals instead of yearly ones, and even those I abandoned after five months. But this year especially, the thought of making any resolutions beyond "survive" is laughable. My life is utter chaos. The babies are legions away from being on any kind of predictable schedule. They are still up all night. I am still averaging about 5 hours of broken sleep a night. My house is a mess because the second I start emptying the dishwasher or cleaning up a pile of toys, someone starts crying and needs attention. Getting my work done for my clients is a struggle, considering it's often done in 764 5-minute increments spread throughout the day. I'm trying to stay current with your blogs. I'm sometimes reading, but rarely commenting. If my Christmas tree is out of my house by April, I'll consider it an accomplishment. This blog is anything but rainbows and sunshine, and frankly, unless a radical change happens soon and life gets significantly easier, not much will change in my writing. It's not really the direction I want to take with this blog. I worry about returning to this time in my life a few years from now and struggling to remember anything positive about it. But it is what it is for the time being. I haven't made any resolutions, but I have written down a list of things I both want to and need to accomplish in the journal that was supposed to store my ideas for essays I planned to write for commercial magazines. I plan on compiling a daily to-do list every evening (or first thing in the morning) each day so I can begin to re-take control over my life. I'm sick of treading water and praying I don't drown. My hope is that sometime in the next month, as the twins turn 3 months old, I'll begin to experience a bit of predictability and even a tiny modicum of peace amongst the chaos. People keep telling me it will get better, and I know they're right. The change just can't come fast enough for me.